Note: most of this hike is on private land, owned by the Gould family. Before hiking on it, you should get permission from the caretaker, Bill Scholl, who can be reached at (845) 586-4056. By being respecful of the landowners wishes, and by taking care to leave no trace, we are more likely to continue to have the prvilege of hiking in this area. I left the trailhead at 1:00 PM, heading up to Doubletop. Started on the trail, then turned right at the Flatiron Brook junction. A little ways up Flatiron Brook there are some pretty waterfalls. I followed an old road left up to the ridge, passing close by a house. Once on the ridge, I climbed increasingly steeply through thicker and thicker brush, patches of thick ferns, and eventually balsam. I reached the peak about 4:30 PM, searched around fruitlessly for the plane wreck, and eventually turned to descend to the Doubletop-Graham col. I descended from the south peak, since the blowdown on the peak ridge made travel very painful. The thought was to get below the thick balsam and contour across to the north. This turned out to be a bad idea: the blowdown was no better lower down, and the slope was steep, making contouring difficult. Looking at the GPS track later, I struggled across the steepest possible part of the slope. I would have been a lot better off on the ridge or lower down. In fact, it would be a lot better to go down to 3100 feet and then contour around the relatively flat route there. I got to the Doubletop-Graham col about 7:30. I looked around for water, since I was nearly out, but there was nothing in the vicinity. 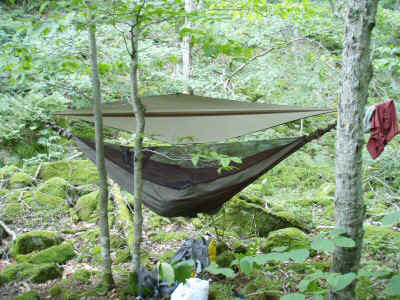 I put up my hammock in the col, in a mossy, rocky patch. As my dinner was heating, I discovered that I had no knife or spoon, making it really difficult to eat dinner. The sound of distant thunder sounded as I tried to slurp up my soup without any utensils. My hammock set-up was pretty secure, I thought. I managed to set up the wider wing of the rain fly on a high branch, making a kind of awning that I could stand under when I got out of the hammock, and where I could put my pack and shoes, . Not long after I went to bed, the thunder and rain came, and what a storm it was. Tremendously loud thunder, amazingly heavy rain, and I was snug and dry. The rain tapered off as I dozed. I woke at around 11:00 to find it was raining again, and a heavy wet object pressed against my face. It felt like a water bag, brimming full. As I twisted around to see what was going on, I felt a couple of quarts of ice cold water pouring on my head and running down my back. It would have exited the hammock at its entrance, except that my sleeping bad soaked it all up before it got there. I jumped up, poured the rest of the water out of the hammock, squeezed as much as I could out of my bag, and tried to figure out what was wrong. I guess my awning, not being angled downward, had collected the water instead of letting it run off. The weight stretched it further, increasing the collection effect. My squirming had convinced it to all run off into the hammock. I got out, tightened the guy lines, and retreated to my wet bag. I kept a close eye on the fly for another hour, until the rain tapered off. I was soaked from being out in the rain, the upper half of my bag was soaked, and the temperature was dropping all through the night. They say down is a poor insulator when it is wet, but even soaked it is a lot warmer than nothing. I didn't really manage to sleep much, because every time I dozed off I would wake up shivering. I did not want to put on my jacket, since it was my last piece of dry clothing. Eventually by 4:00 AM I got up and put it on, and managed to reduce my shivering enough to sleep fitfully until daylight. Finally reasonably warm, I lingered in bed until 8:00. When I got up, it was much cooler than the day before, breezy and a little less humid, so I hung up all my wet clothing and gear and went exploring. When I cam back, everything (but the bag) was reasonably dry. I discovered that the Jetboil stove would not start easily if it was wet. I had left it packed but out in the rain, and it had collected water inside. (I found two inches of rain in my cup.) The built-in lighter would only occasionally produce a spark, and even then it would not light. I did get it going with my lighter, but even after running for a while it did not dry out enough to start itself. I guess I have to keep a lighter handy as backup. The climb up Graham ridge was challenging. There are numerous cliffs of 20-30 feet in height, between which are flat spots choked with downed trees. Part way up I found a tiny spring, and filled my water bottle and bag, and drank as much as I could hold. Near the top the brush becomes almost impenetrable. The last quarter mile, which looks so easy on the map, was the hardest, because of how thick the forest is. I finally broke into the summit clearing at 11:30, scratched and tired. I took advantage of the sun and the breeze to further dry out my clothing and sleeping bag, while I had lunch and admired the view. I climbed up the tower a little ways so that I could see some of the surrounding terrain. In the winter, I could see all this from ground level. After struggling through the thick brush ascending Graham, I did not have the desire to follow the ridge back down to the parking area, but opted instead to hike down the trail to the Turner Hollow road shown on the map. The trail had its share of blowdown, but it decreased with elevation. I made fast progress, reaching the turnoff at 1:00. The Turner Hollow road was really faint, but definitely there, although downed trees made for continuous detours. Once the road reached the base of the valley, it disappeared into a jungle of stinging nettles. On the map, the road climbs up the left bank, out of the lowlands. But it seemed to take forever to reach that point on foot. It is so frustrating hiking through chest-high nettles, hiding rocks, downed trees, holes, streams, and other hazards that are impossible to see. The slightest stumble threw me headlong into the nettles, over and over and over again. I zigzagged back and forth across the valley looking for an easier way. It seemed interminable, but I eventually spotted a very faint sign of roadway leaving the valley floor, out of the torture. From there, progress was a lot quicker. Eventually I spotted a series of pretty waterfalls, then a pair of hikers with a dog walking along near them. I guessed I must be just about at the road, so I left the comfort of my path and descended to the stream. I followed a ways behind the other hikers, who it turned out were really far from the road after all. I finally reached a big waterfall that looked hard to descend, but I was able to cross over the stream and follow another road that headed off in the direction of the trailhead. When I finally came out on the road I only had a half mile to go back uphill to get to the car. When I got home I discovered that I had a painful rash on both my arms. Surely I had pushed aside a thousand branches and plants. I guess a few of those must have been poisin ivo or perhaps poisin sumac. I now have a better understanding of why the bushwhack routes more commonly follow the ridges rather than the valleys. Turner Hollow was incredibly green -- moist and lush down where it was flat enough for easy travel. But all that vegetation made for tedious progress and must have been where I met up with the poisin plants.